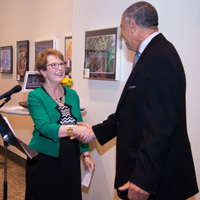 Webster President Elizabeth (Beth) J. Stroble joined U.S. Rep. William Lacy Clay of Missouri on April 29 to honor 36 outstanding young high school artists. 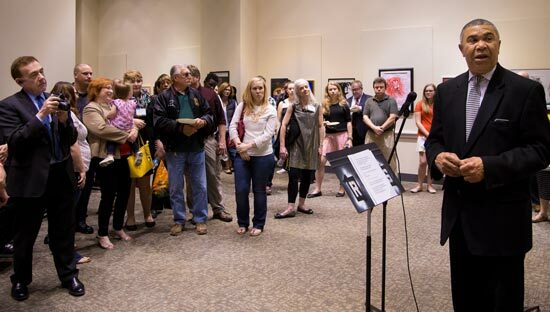 The artists represented 11 high schools in Missouri's 1st congressional district for the 16th annual Congressional Art Competition. This is the first year the competition was held in the gallery of the historic Arcade Building at Webster's Gateway Campus in downtown St. Louis. The winner's work will be displayed at the U.S. Capitol complex in Washington, D.C.
Clay discusses the work of 36 outstanding young high school artists representing 11 high schools in the 1st district.